Develops logic and spatial perception while kids learn to be tactical. Blokus is an exciting game of strategy for the whole family! Starting at your corner, place your game pieces on the board. At your turn, each new piece must touch at least one other piece of your same color. Your goal is to cover as much of the game board as possible with your pieces. While doing so, you want to block out your opponents pieces! The winner is the player who is left with the smallest area of his remaining pieces. 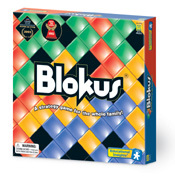 You'll love the excitement Blokus game brings! Each player chooses a color and takes a set of 21 pieces. Players take turns placing pieces on the board, each starting from the corner of their color. Each new piece must touch at least one other piece of the same color, but only at the corners! Pieces of the same color cannot be in contact along an edge. There are no restrictions on how pieces of different colors may touch each other. The goal is to cover as much of the board with your pieces as possible. Players who put down all their pieces earn extra points! Be tactical. Blockade your opponents while expanding your own territory. The game ends when all players are blocked from laying down any more of their pieces. This also includes any players who may have placed all of their pieces on the board. Scores are tallied. And the winner is the player for whom the total area of his/her remaining pieces is the lowest!